Birds are the most frequently seen members of the fauna, but there are other remarkable animals from many different groups, vertebrates and invertebrates, which can also be seen in the area. It is sadly interesting to know that just a couple of hundred years ago there were still Jaguars in Buenos Aires. They were hunted mainly for its fur and, in addition to the destruction of its habitat, today the species only survives in Argentina in some forests of the North West, North East and the Chaco, and it’s in danger of extinction. One of its local names, “tigre”, (Spanish for “tiger”, although a different species) gives its name to a city, some kilometers north of Buenos Aires. Other species of large mammals, such as the Marsh Deer (Blastoceros dichotomus) and the Pampas Deer (Ozotoceros bezoarticus) are also in danger of extinction, and are not part of Buenos Aires city’s fauna any more, although there is an important population of Marsh deer not far away from it, in the delta of the Paraná river. 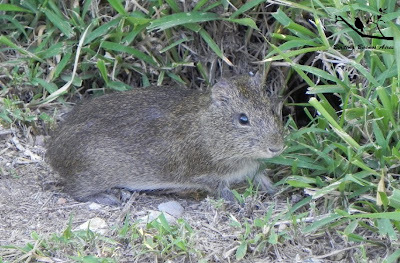 Nowadays the mammals still present in the area are small and very difficult to see, except for some species of rodents. This last group (the rodents) is well represented here, mainly by rats and mice, but with some very remarkable species of the region, such as the Nutria (Myocastor coypus), which name comes from the Spanish word for “otter” although it is not related to real otters (“Coipo” is its proper name), and the Pampa’s Cavy (Cavia aperea), which is the wild ancestor of the Guinea Pig (domesticated by ancient Incas). 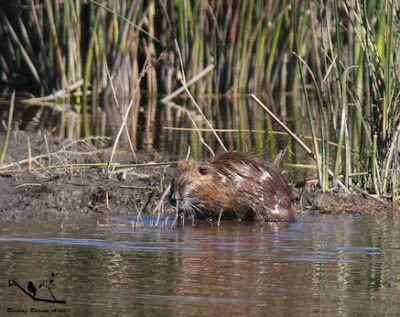 Nutrias are common in the lagoons of the region, and Pampa’s Cavies are abundant in the areas with grass, which constitutes its main food. Two species of marsupials are common, the White-eared Opossum (Didelphis albiventris), with a small population living in the Botanic garden of the city, and the Thick-tailed Opossum (Lutreolina crassicaudata), which sometimes can be seen crossing the paths of the Reserva Ecológica Costanera Sur. Bats are another group of mammals with a good chance to be seen, especially in spring time and in the summer, when they are more active, hunting flying insects (all the Buenos Aires’ bats are insectivorous). Two species are the most common ones: the Hoary Bat (Lasiurus cinereus) and the Brazilian free-tailed Bat (Tadarida brasiliensis). 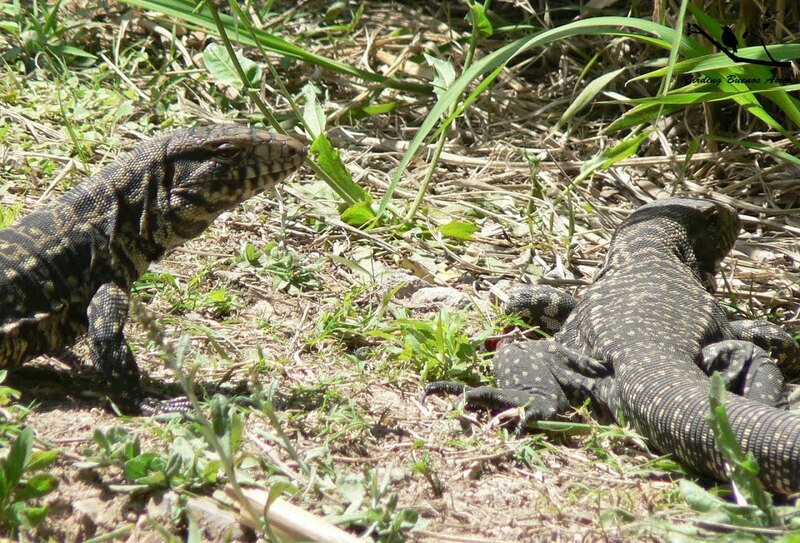 The most remarkable reptile is the Argentine Black-and-White Tegu (Tupinambis merianae), which is common in spring and summer, crossing the roads and paths of the ecologic reserves. It is the largest lizard in Argentina, and it can reach a length of up to 150 cm, although the commonest findable size is of around one meter. A relative of this species, the Rufous Tegu (Tupinambis rufescens) is of similar characteristics, but much less common. 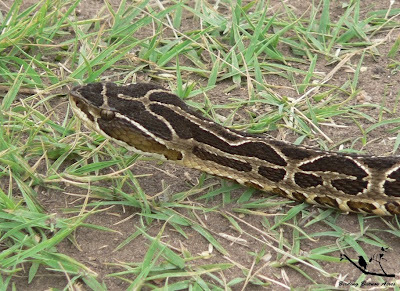 There are many species of snakes, been the most notable one the Crossed Pit Viper (Bothrops alternatus), a poisonous viper which inhabits the Reserva Ecológica Costanera Sur (this is the main reason for not leaving the walking paths of the reserve). 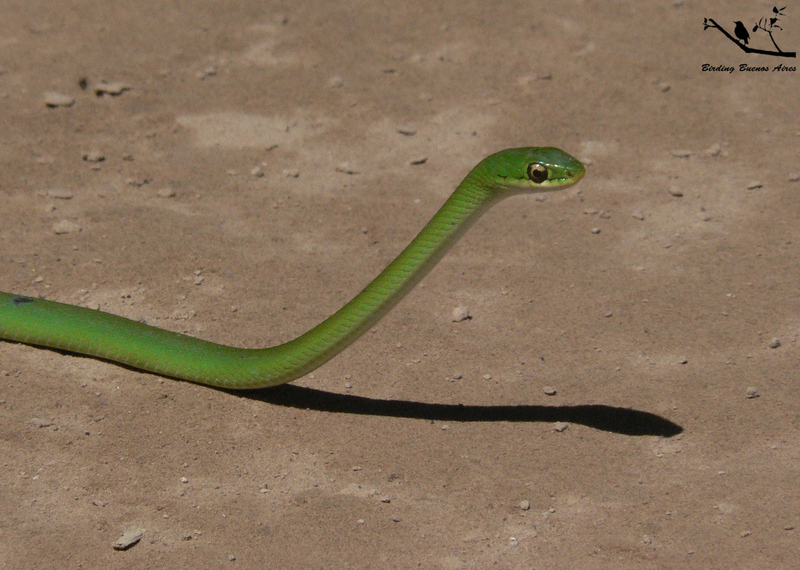 Another beautiful snake is the Brazilian Green Racer (Philodryas aestivus), with its wonderful emerald color. There are 3 species of aquatic turtles, the Lagoon Turtle (Phrynops hilarii), the Orbigny’s Slider (Trachemys dorbigny) and the Snake-necked Turtle (Hydromedusa tectifera). There are also many species of amphibians, which is logic considering the humid conditions of Buenos Aires (sometimes too much humid for its human population...). These amphibians, frogs and toads, are mainly heard when the rain falls, before and after it. 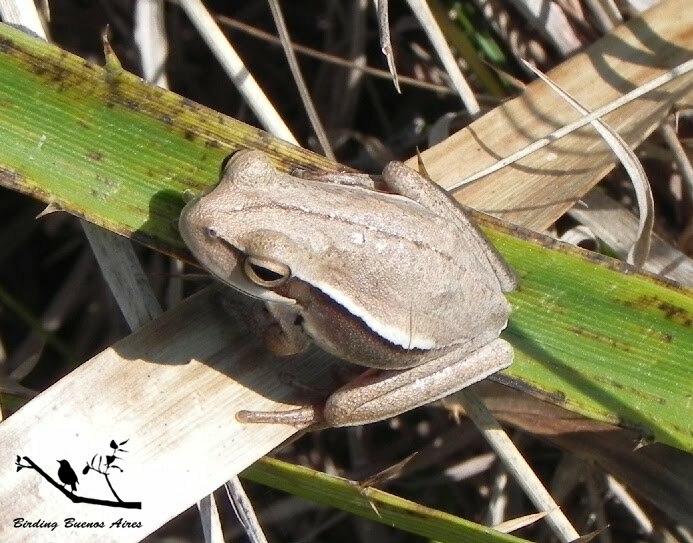 The most remarkable species are the Native Frog (Leptodactylus ocellatus), the tree frogs Common Tractor Frog (Hypsiboas pulchellus) and Striped Big-Snout Tractor Frog (Scinax squalirostris), the Common Toad (Rhinella arenarum) and the beautiful Common Escuerzo (Ceratophrys ornata), which can be seen only after long periods of strong rains. This is a group of animals which for sure you won’t see easily, unless you go fishing, but it’s still important to describe them a little bit because of its importance and high diversity. They are present in the Río de la Plata, and in the many marshes, water streams and lagoons (even in Palermo’s parks) of the region. The fish fauna of the Río de la Plata basin is of sub-tropical/tropical origin, and shares many of its species with the Amazon basin, although much less biodiverse, especially in this latitude with a temperate weather. Before the beginning of the twentieth century, with the industrialization of the area originating an intensive pollution activity that continues till today, the Río de la Plata hosted a wealthy environment with a rich species assemblage now very modified. In addition, the construction of damns in several points of the main basin’s rivers (Paraná and Uruguay) has interrupted the natural migration of many species that used to migrate southward in the summer, and the opposite direction in winter. This has damaged very much their populations. The Río de la Plata and its tributaries are the southernmost limit of distribution for the majority of its fish species. Between the most remarkable ones are the Piranha fish, which are abundant on summer, with around three species, including the famous Red-bellied Piranha Fish (Pygoscentrus nattereri) with its local variation which has a golden/yellow belly instead of the red Amazon type. 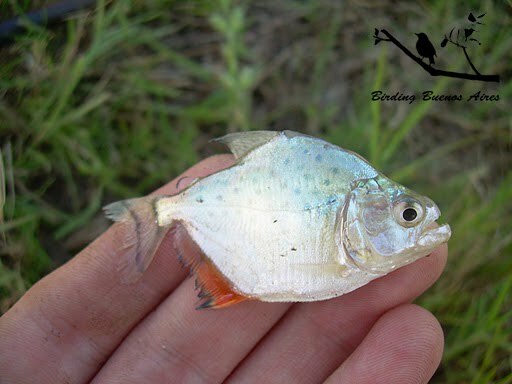 In Argentina these species are popularly known as “Palometas” or “Palometas bravas” although the first name is also used for other species with a tall and flat body. Very related to the piranha fish are the Pacus. Their body has the same shape but the main difference are their teeth which, instead of being sharp, they are more similar to human molars, and help them to chew fruits and seeds that fall to the river. The Pacu (Piaractus mesopotamicus) is one of the species that have disappeared from the area of Buenos Aires. It’s still common in the north of Argentina, and can reach a weight of more than 10 kilograms. 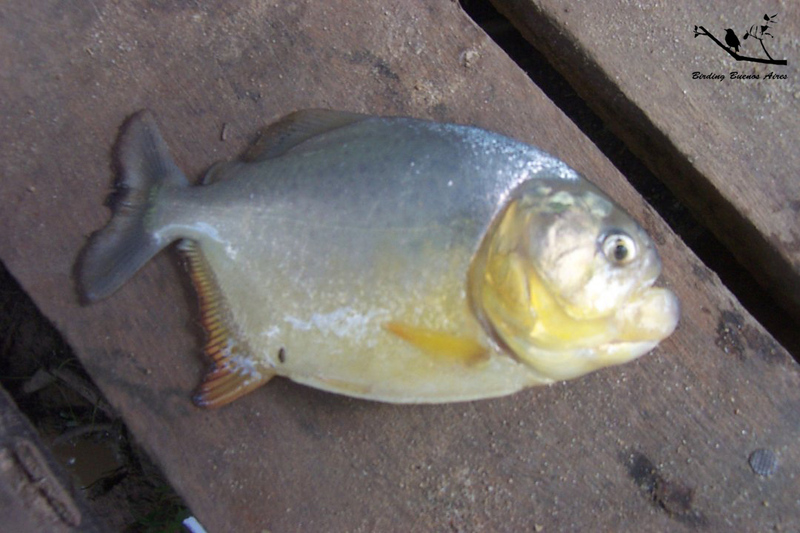 But there’s a relative species still findable in the area, called “Clock” Pacu (Mylossoma paraguayensis). It’s much smaller, with an even rounder shape. The “tiger of the river”, as it’s sometimes mentioned in a poetic manner, is the Golden Dorado (Salminus maxillosus) named after its color, which is golden yellow. It can grows up to 1 meter and more than 30 kilograms (very rare to find nowadays), but in the area the average is much smaller, constituted by juvenile specimens. It is the species in the area with the longest migration movements, with records of more than 1000 kilometers. It’s a hunter of other fishes, even big ones. The silurids (“catfishes”) and their relatives are well represented here. 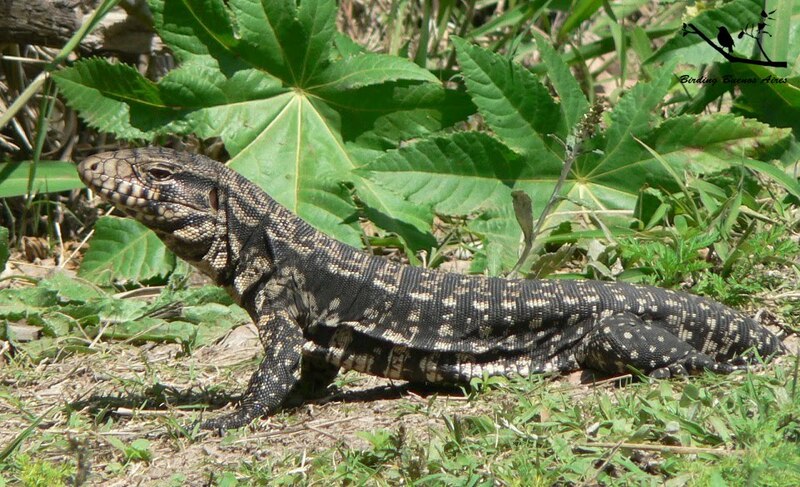 The huge Spotted Sorubin (Pseudoplatystoma coruscans), which can reach more than 1.5 meters and almost 100 kilograms (or at least it did, back when its population wasn’t as damaged with over fishing as it is today), is still present in the area of Buenos Aires but only with juvenile individuals, being an uncommon species. It is also a migrant. 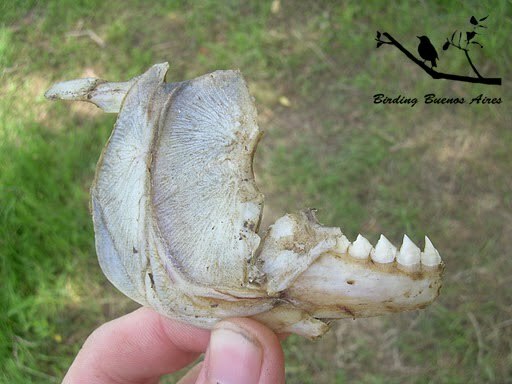 It is a carnivore, and with its wide mouth can swallows very big preys (mainly other fishes). The Corydoras (Corydoras paleatus) is another member of this group, very common in the area, and popular too because of its use in aquarium. Loricarids are relatives of the catfishes, and some of their species are among the commonest fishes of the area, such as the “Vieja del agua” (Hypostomus commersoni). There is a migrant silurid that arrives to the delta of the Parana river for spawning, returning then to the sea, where it lives during the rest of the year. It’s the White Sea Catfish (Netuma barba), which can size a length of 70 centimeters and even more. One of the most important species, in terms of biomass and position in the food chain (been, in their different stages –eggs, larvae, juvenile and adults– the main source of food for carnivore fishes) is the Tarpon Prochilodus (Prochilodus lineatus), called “Sábalo” by the locals . 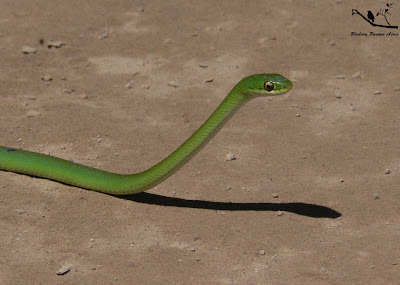 It is a migrant that grows up to 70 centimeters and feeds on the organic components of the mud. A similar species in shape, although different in its feeding habits, is the Boga (Leporinus obtusidens) which is an omnivore that reaches 80 centimeters and up to 10 kilograms. These two species are very common in the region (especially the first one). 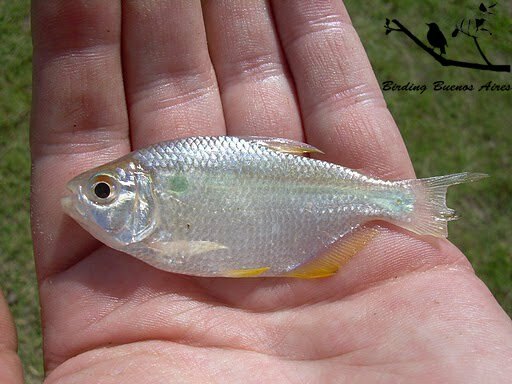 The Carp fish (Cyprinus carpio) is an exotic species (introduced by humans) that has become very common in the Río de la Plata and in the lagoons of Buenos Aires province. As other exotic species, they can compete with the local fauna and affect them in many ways, sometimes too harmfully. The Spotfin hatchetfish (Thoracocharax stellatus) is among the most remarkable fresh water fishes of South America, being one of the very few species of fish that can do something similar to fly. It’s a tiny fish with very big pectoral fins, which escapes from its predators by jumping out of the water (several meters above the surface) and “flying” by moving its fins as if they were wings. 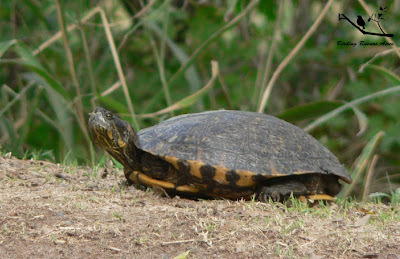 They arrive to the Río de la Plata in the summer, as many of the other species. Another remarkable fish is the Chafalote (Rhaphiodon vulpinus), a predator with a long thin body and two long and sharp conspicuous teeth in its jaw, which they use while hunting small fishes. There is a family of fishes that belongs to the continents of South America and Africa, with a very high diversity of species: the Cichlids. They are very territorial and take good care of their offspring, in some cases carrying them inside of their mouth. In the area of Buenos Aires the commonest cichlid is the “Chanchita” (Australoheros facetus), present even in Palermo’s lakes. There is a similar species called “Siete colores” (Gymnogeophagus meridionalis) which is more colorful. Then there is a gender of cichlids with a long shape and a characteristic spot in its caudal fin that resembles an eye, and functions as a defense by not letting know to their predators where the real head is. This is the gender Crenicichla, whose members are mainly predators of small fish. 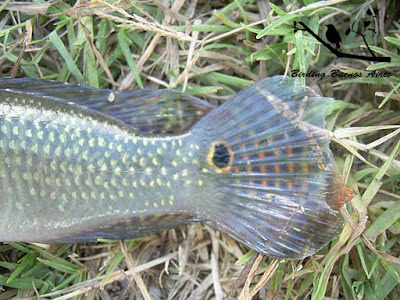 The Pike cichlid (Crenicichla lepidota) is one of the species in the area. A special mention deserves a group of tiny fish with a particular way to adapt to the environment. They are called “Killys” and live on shallow bodies of water that depends on the rains. Their eggs can survive long periods of drawings until it rains again and the larvae hatch. They are considered by many aquarists as the most beautiful fresh water fishes, with very conspicuous colors. One of the species is the Argentine Pearlfish (Austrolebias bellotti) which can be found in some areas of the city and its surroundings. In winter there is one species that becomes common (the opposite of the rest of the species), and it’s the Silverside (Odontesthes bonariensis). They move in schools and use to swim not far form the surface. 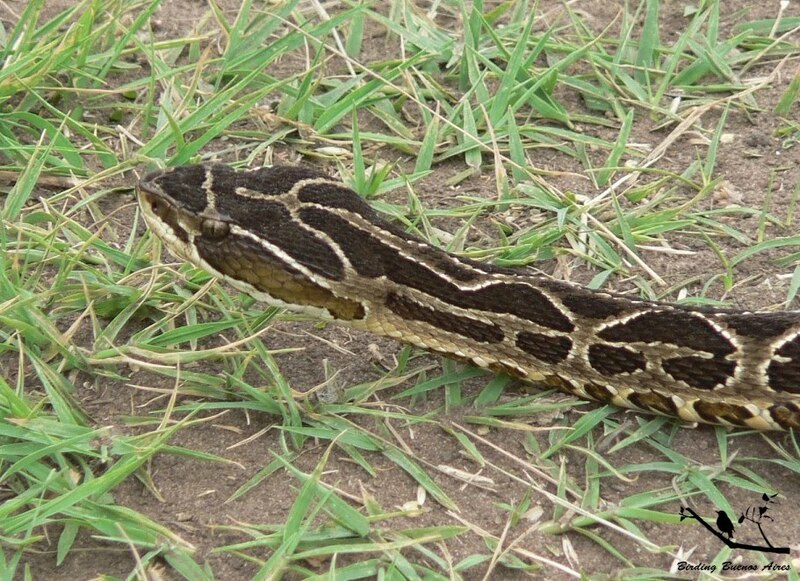 It grows up to 50 centimeters but the average length is much smaller. Finally, some of the most remarkable species are the South American Fresh water Stingrays (in the area Potamotrygon motoro and Potamotrygon brachyura). They arrive to the Río de la Plata in the summer and are among the world’s largest fresh water fish species, although in the area they are mainly small juveniles. As their name suggests they have poisoned stings (two of them) in their tails, which can be very painful (although not deadly) for humans if stinged. The group of the invertebrates is well represented here, with some very remarkable species. Following are just some of the most notable common (or easy to see) invertebrates, among the insects and the arachnids. Among the insects there is a group that must be mentioned separately: the diurnal butterflies. Many of them find their southernmost limit of distribution here. 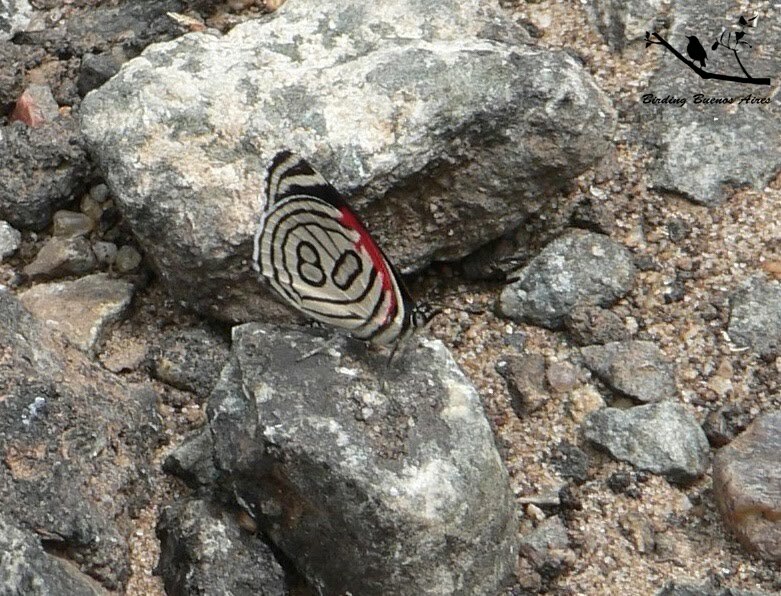 That’s the case of the Morpho genera, which finds its southernmost limit in the continent with the Argentine Flag (Morpho epistrophus argentina). 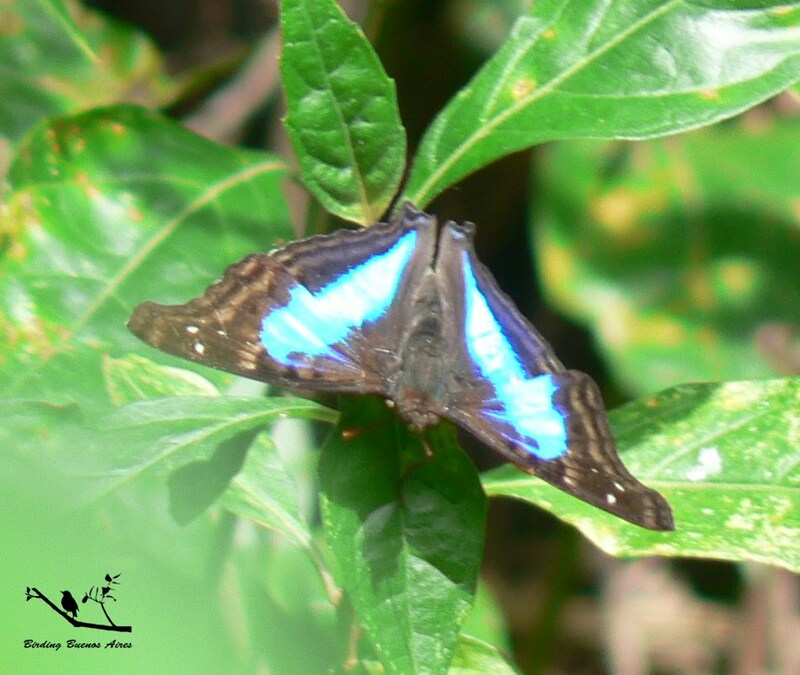 With around 10 centimeters of length between the tips of their white/light blue colored wings, it’s one of the largest Buenos Aires’ butterflies. 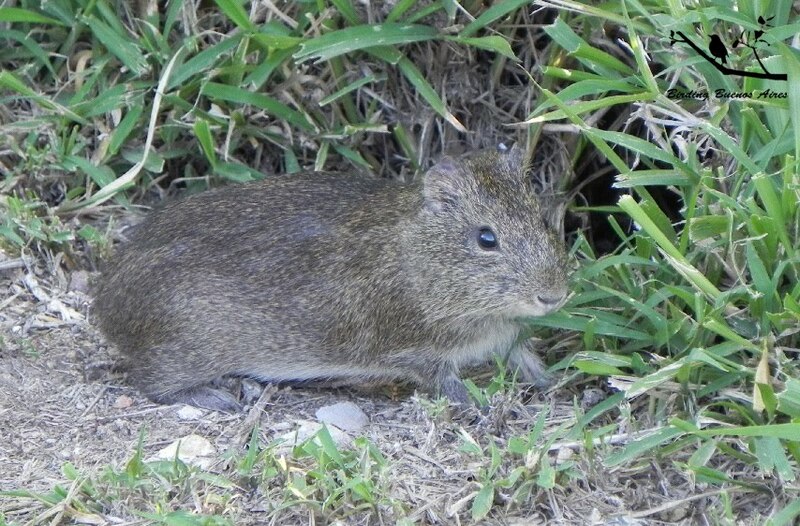 It is common in the riverside forest of the delta of the Paraná River, Martin Garcia Island, and the Natural Reserve of Punta Lara (near the city of La Plata). In the reserves of Buenos Aires it's possible to find it in Ribera Norte and Vicente López, although its presence is occasional y the Reserva Ecológica Costanera Sur. 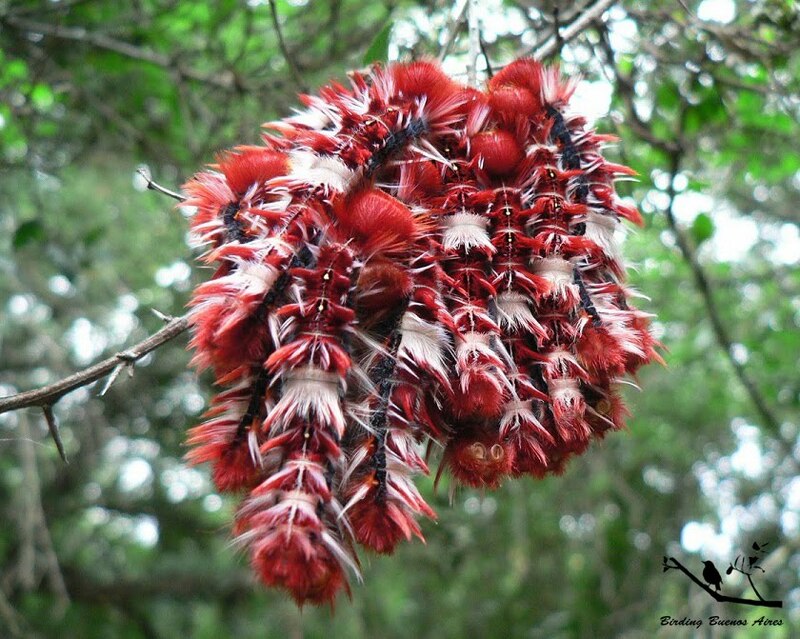 Among the most remarkable Neotropical genera of butterflies is the Diaethria. 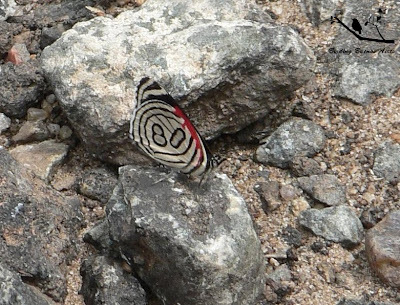 One species of this genus reaches the riverside forests of the Río de la Plata: the “Eighty” (Diaethria candrena). Its name comes from the number “80” legible in the ventral side of its hind wings. The group of the Helicons has some conspicuous representatives in the area. Their host plants (for their caterpillars) are the Passiflora, from which they take the toxicity that gives them an effective protection against predators. The Julia (Dryas iulia alcionea), the Crimson-patched Longwing (Heliconius erato phyllis) and the Gulf Fritillary (Agraulis vanillae maculosa) are present in the area of the city, been the last one the most common (even abundant) species. 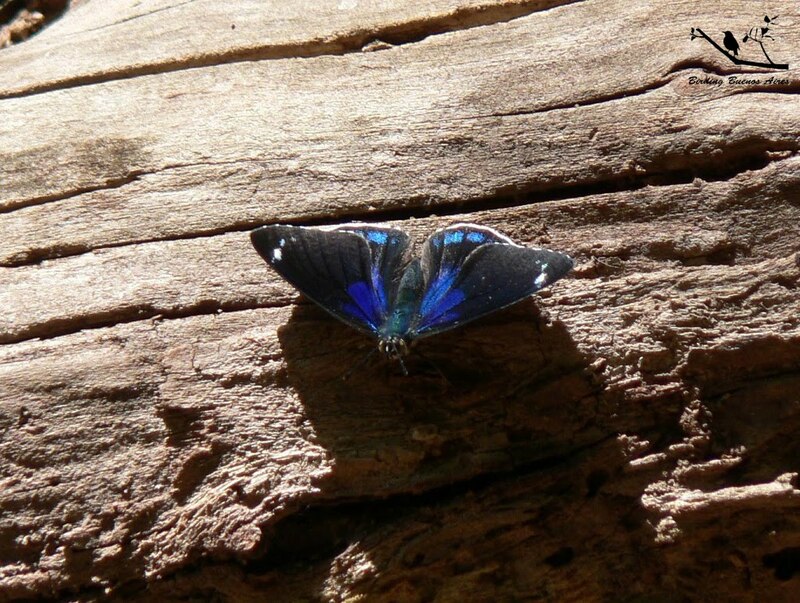 Another typical representative from the riverside forest is the Crystalline (Episcada hymenaea), with transparent wings. They live in the deep of the forest, avoiding sunny areas. In the Espinal forest, there is one of the most beautiful species of the province, which depends very much on the Tala trees. This is the Sapphire (Doxocopa laurentia). The male of this species has two greenish blue bands in the dorsal side of their wings. 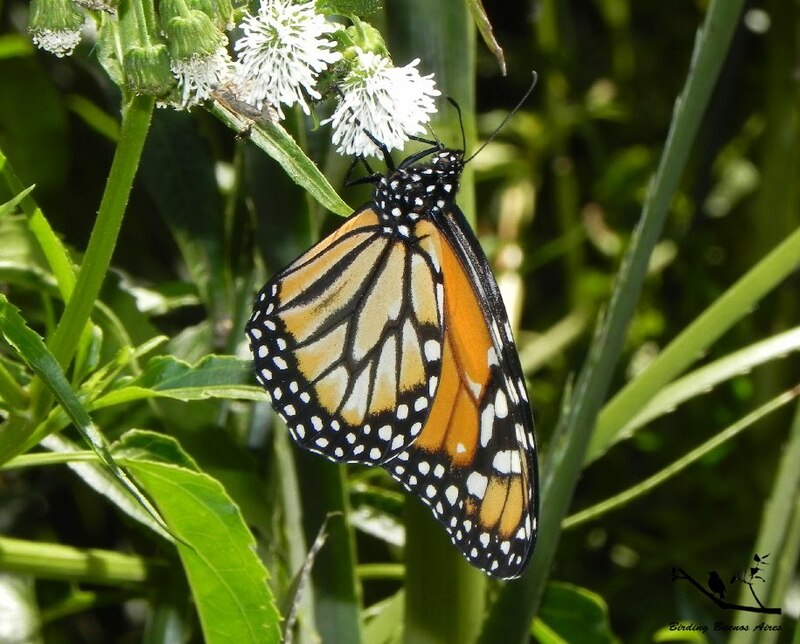 Other remarkable butterfly species are the Polysticto (Battus polystictus), the Thoas Swallowtail (Heraclides thoas thoantides), both of them from the Papilionid family, the Crimson-banded Black (Biblis hyperia nectanabis), and the Monarch (Danaus plexippus erippus). 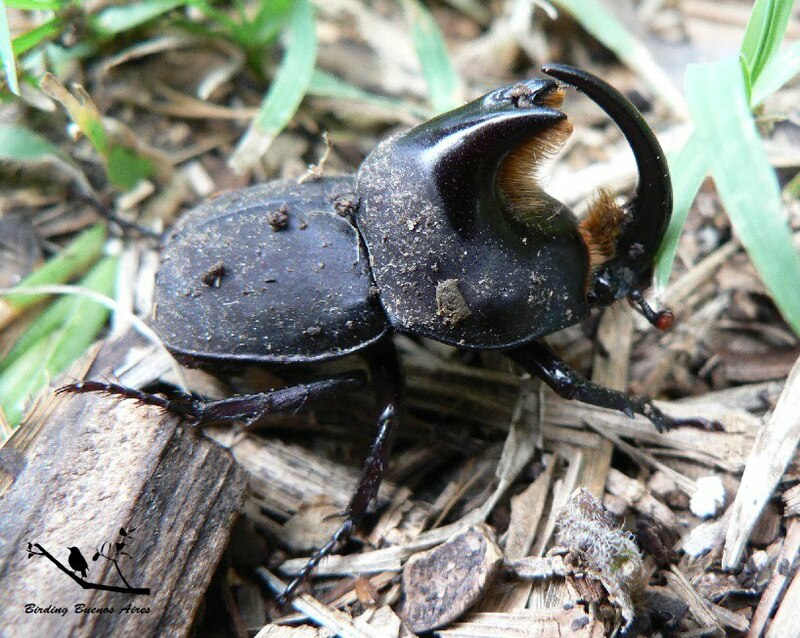 Other remarkable insects in the area, among a plethora of others, are the Camoati wasps (Polybia scutellaris), a species of social wasp, which is black and very small, but builds a very characteristic huge nest; and the Rhinoceros Beetle (Diloboderus abderus). 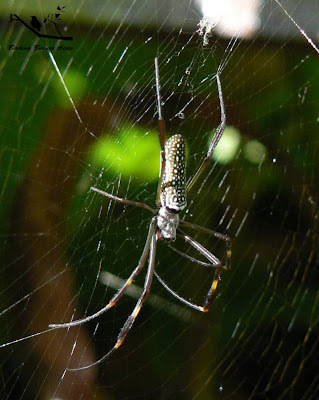 Finally, from the plenty of arachnid species in Buenos Aires area, we can quote the big Tarantulas, with several species in the area, and the wonderful Golden orb-web spider (Nephila clavipes), which lives among the riverside forests of the Río de la Plata. Scorpions are also present in the city.